This is an excellent, delicious meal with low carbohydrate content. The whole family will surely love it. 1. Brush muffin pans with oil. Press a slice pine honey ham into each muffin cup. Place 1 tbsp cheddar cheese into 4 ham cups. Carefully crack an egg into each of the 4 ham cups. Season each egg with ¼ tsp of MAGGI MAGIC SARAP® and a pinch of pepper. 2. Alternately, beat the remaining 4 eggs in a large bowl. Season with the 1 tsp of MAGGI MAGIC SARAP® and freshly ground pepper. Add fresh mushrooms and asparagus. Carefully pour mixture into the remaining 4 ham cups. 3. 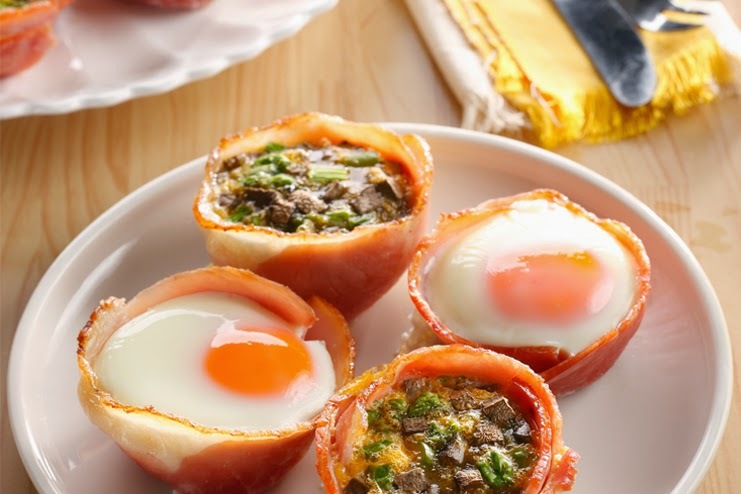 Bake ham cups in a 350°F oven until eggs are set, around 10-15 minutes. Set aside for 10 minutes to rest. Serve warm.